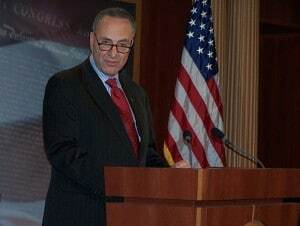 Sen. Schumer challenges Republicans to vote against legislation. Sen. Charles Schumer is pushing legislation that would prevent vehicles needing repairs from being rented by rental car companies or auto dealers. After a year of record automotive safety recalls, proponents are hoping Washington lawmakers will finally pass a long-stalled measure meant to prevent rental firms and auto dealers from renting vehicles with unrepaired defects to consumers. Re-introduced into both the Senate and House last week, the Rachel and Jacqueline Houck Safe Rental Car Act of 2015, the measure is named after two sisters killed in the 2004 crash of a Chrysler PT Cruiser they had rented that had a serious defect that hadn’t been fixed. A similar measure died at the end of the last Congress in the face of strong resistance from, among others, U.S. auto dealers. But the mood on Capitol Hill appears to be changing, according to New York Sen. Charles Schumer, a lead sponsor, after automakers recalled more than 60 million vehicles in 2014, and GM set up a victims fund to compensate those killed or injured due to a defective ignition switch. “For those of us long-fighting to close auto safety loopholes for rental and used cars, we feel we have the wind at our backs,” the New York Democrat told TheDetroitBureau.com. The bill would, in essence, force both rental firms and dealers to pull from their fleets any vehicle that has not had repairs completed as part of an ongoing recall. That has become a significant concern for safety advocates who point not only to the crash that killed the two sisters but to data from the National Highway Traffic Safety Administration that shows less than 70% of the vehicles covered by the typical recall actually ever get fixed. While increasing that repair rate is a valid priority, the National Automobile Dealers Association lent its considerable lobbying power to defeat the measure the last time it was before Congress. And citing concerns that the 2015 version of the Houck Bill is too broad, NADA officials want significant changes before they sign on. “NADA has concerns about the economic impact the mandate would have on small businesses and consumer and we encourage policymakers to keep this in mind as we work towards the shared goal of increasing recall rates,” said Jared Allen, the senior director of the trade group’s media relations. Among other things, NADA contends that the bill would pull rental vehicles off the road for such minor issues as an owner’s manual having the wrong factory contact number. And it could lead to extensive problems for them if a manufacturer couldn’t supply enough necessary parts to complete repairs in short order – an issue that has complicated several recent recalls, such as those involving the GM ignition switches and Honda airbags. For his part, Clarence Ditlow, director of the Center for Auto Safety, has argued that “all recalls are potentially dangerous,” and cars should not be driven until they are fixed. What could help soften the opposition of the dealers group and other critics is the fact that the nation’s largest automaker, General Motors, is also lending the Do Not Rent bill its support. “We have a specific policy. We want to make sure our vehicles are cared for properly before they are put in the hands of customers,” GM CEO Mary Barra told TheDetroitBureau.com. The automaker has taken a much proactive stance since Barra became chief executive early last year – just weeks before it announced the ignition switch recall covering 2.6 million vehicles, and revealed it had delayed responding to the problem for a decade. All told, GM recalled more than 30 million vehicles in 2014 due to a wide range of safety issues. In a sharply polarized Washington, it is far from certain the Houck Bill will fair any better than it did during the last Congress. Several observers said they wouldn’t be surprised to see some compromises to satisfy past opponents, such as NADA. But they are hoping that broad public concern about auto safety will help take potentially unsafe vehicles out of the nation’s rental fleet. This entry was posted on Wednesday, May 6th, 2015 at and is filed under Automobiles. You can follow any responses to this entry through the RSS 2.0 feed. Both comments and pings are currently closed.